During Microsoft Ignite the Azure IoT Edge version 1.0.2 was released with some important improvements like proxy support. Today I updated my two Raspberry Pi’s running Raspbian to the new IoT Edge version. 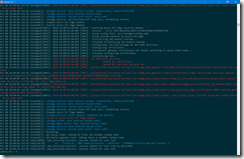 After the update to version 1.0.2 the Azure IoT Edge daemon fails to start. So, I used the following command to get the daemon logs. But this did not provide me with the necessary information I was looking for. I changed the command to journalctl –no-pager and got the information to troubleshoot the issue. Oct 08 16:54:49 rp3-01 iotedged: 2018-10-08T14:54:49Z [ERR!] - An hsm error occurred. As you can see in the screenshot and the log output, the edge_owner certificate is expired and causes an HSM initialization error. 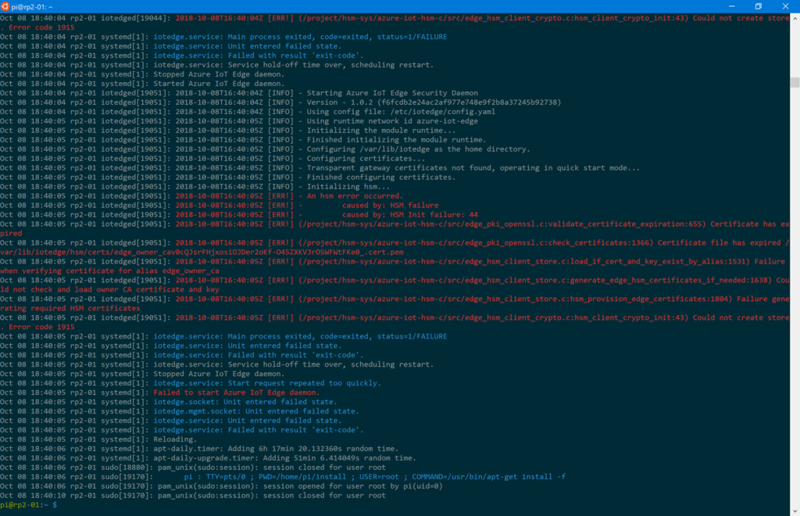 This error lets the Azure IoT Edge daemon fail at the startup. The current workaround is to delete the edge_owner certificate under the path /var/lib/iotedge/hsm/certs/ and restart the Azure IoT Edge daemon. Afterwards the IoT Edge daemon should start without any issues and you can continue operating your IoT Edge device. There is also an open GitHub issue where I posted the workaround and just today the Microsoft PG confirmed that this will be fixed in the next release of Azure IoT Edge. This entry was posted in Azure and tagged Cloud, Container, Hybrid Cloud, IoT, Microsoft Azure, PaaS, Public Cloud on 8. October 2018 by Daniel.